I was standing watch early this morning, engrossed in my book and tucked in neatly behind the clear plastic panel that provides wind protection in the cockpit. All of a sudden, “SMACK!” A large flying fish hurled itself directly at my head, at the last moment hitting the panel and flopping to the deck, unfortunately just out of reach for a safe rescue and release – if it’s dark outside, we don’t leave the cockpit without two people on deck, and this wasn’t an urgent enough matter to wake Wags. Later this morning another flying fish attempted his kamikaze maneuver as I sat minding my own business. This one ricocheted off the panel and into the cockpit where it came to rest on a cushion. Thankfully, Wags stepped up to the task of returning the stinky interloper to the sea before it expired, and if you know how smelly flying fish are you understand why his chivalry is so greatly appreciated. Nothing else to report except the day’s fun facts. *Distance from the ship’s log may include an effect from current, which can inflate the number. We departed the Galapagos for the Marquesas yesterday afternoon under gray skies and a light mist of rain. The wind was light and variable for the first several hours but finally shaped up last night and we made up some ground. All is well and we’re working to settle into our offshore routine and sleep cycles – in other words, getting used to sleep in intervals of 2 hours and 4 hours at night with a watch in between, and making up the rest via naps throughout the day. Our friend, Tom, joined us in Panama City to crew with us on our passage. 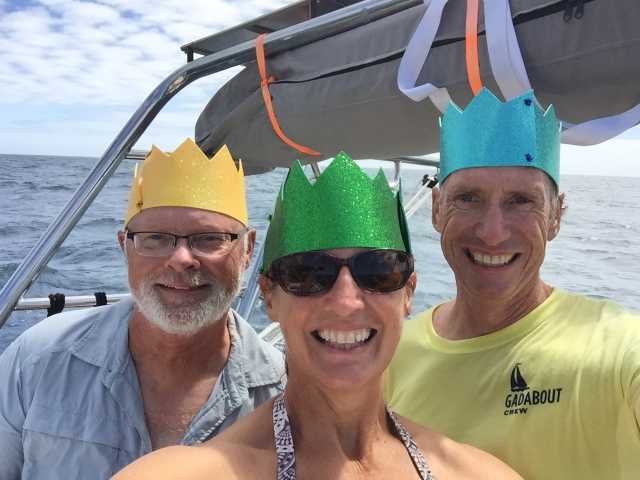 After leaving the big city behind and spending several days enjoying an isolated anchorage in the Las Perlas islands, collecting wild mangoes and coconuts and trading fishermen for lobsters, we departed for the Galapagos high on life. Our good humor was short lived, however, as once we were underway the conditions rapidly deteriorated. Rain showers, wind and waves on the bow most of the time with a strong north running current (the Humboldt, maybe you’ve heard of it) became the theme for the next eight days. In the mornings the wind would start out usable but would shift into our face as the day progressed and collude with the current to bend our course away from our destination. We tried to gain as much westing as we could before it became illogical and we were no longer aiming towards the Galapagos. Tacking wasn’t a good option as due to the wind shift during the day our new heading after a tack would have had us moving backwards. Ultimately the wind would die at sunset. This forced us to motor during the night in an attempt to regain the ground we lost while sailing. Oh, and we couldn’t motor directly towards our goal as the waves would bash us unmercifully and the current would slow our pace to under three knots. We ended up with a sawtooth pattern that still frustrates me just to look at it. We spoke to other cruisers who endured the same conditions and they said it was the worst passage they have had since sailing through the Mediterranean, across the Atlantic, and through the Caribbean. If we had it to do over again we likely would have made for Ecuador and explored the mainland a bit then crossed with more favorable wind and current to the Galapagos. The conditions to Ecuador would have been similar but it would have shaved some distance and allowed us to visit an additional place for the same amount of suffering. One highlight was crossing the equator. For those unfamiliar, crossing the equator for the first time in a boat is a big deal. This is Neptune’s realm and if you aren’t careful to appease him, bad things could happen. Before one has crossed the equator he is considered a lowly “pollywog”, barely worthy of Neptune’s derision, but after crossing and paying the proper respects, one is considered a “shellback” and member of Neptune’s court. It is surprising that after 24 years in the Navy and over three years of sea time, I had never actually crossed the equator aboard ship. And so it was that I, too, needed to be inducted into Neptune’s court. Costumes were made, recitations were given, and rum was offered. Tom served as Neptune’s proxy for parts of the ceremony as he had the longest (only) beard. Our “baby on board,” the Gadabout rum cask, served as a stand-in for the kissing of the Royal Baby’s belly. Unfortunately the seas were too rough to swim across the equator but we were all ceremoniously doused with the chilly equator water. It was a fun way to break up the passage and we all walk a little taller knowing that we are now honorable shellbacks. We finally made landfall in the Galapagos after 7 days, 21.5 hours. The direct distance from the Las Perlas to the Galapagos is 844 miles. We travelled 1083. We arrived in Wreck Bay on San Cristobal Island mid-morning and our agent came out via water taxi to meet us. He gently urged me to check the cleanliness of Gadabout’s hull before the inspector arrived. Since the Galapagos are such a unique and pristine environment the government is very strict about arriving yachts being perfectly clean with no barnacles or growth whatsoever. I dove into the cold water and made sure that we were up to code. Almost as soon as I was in, a young sea lion came to check on me and see if I needed any help. Completely fearless she swam around me, came face to face to check me out, and closely monitored my progress. With that complete the crew took a much-needed nap before the entourage of officials arrived later that afternoon. I think we counted eight officials in total if you count the fumigation guy. Using an agent is mandatory and we were glad. The amount of red tape and bureaucratic hoops is dizzying. With Bolivar leading the charge everything went very smoothly and I just signed and stamped whatever was put before me. Our first beer ashore tasted mighty good that night and thus began our exploration of this new and exciting place. After a great night of sailing and the wind pushing us in the direction we wanted to go, we anchored in Puerto Baquerizo Moreno, San Cristobal Island, Galapagos this morning. Today is being spent cleaning the boat, meeting with our agent and various officials, getting the bottom inspected (fingers crossed it’s clean) and a fumigation completed. We’ll be posting a wrap-up of our travels in Panama and our passage to the Galapagos soon, as well as lots of pics of the amazing wildlife here. For now we’re going to enjoy being at anchor (rather than on a 20 degree heel), catch up on some rest and have a celebratory drink. Thanks for following along! Day 9: We are shellbacks! We crossed the equator this morning and we are officially in the South Pacific ocean! A proper ceremony was held and Neptune granted us permission to transition from lowly polliwog to honorable shellback. Photos and transcript to come when we get to wifi. We’re making good time now and the winds are in our favor, finally – must have something to do with that rum we gave Neptune. We should be pulling into Isla San Cristobal, Galapagos tomorrow. Our birds “friends,” and I use that term very lightly, have stuck around for a couple of days now and have completely worn out their welcome. Sure, they’re fun to watch as they try to keep their balance on the bow as the boat pitches and rolls, taking breaks to dive after a school of flying fish, using their feet and tails as they come in for a landing. What’s not fun, though? The sheer amount of poop they generate and fling at the boat. They’ve taken to using our sails (and canvas, and decks) as target practice. Yesterday they even had the audacity to use crew member Tom as the target. And scored a direct hit! We’re trying to take it in stride – you know, seeing nature and all – but we suspect the cleaning we’ll need to do when we reach the Galapagos will be enough to drop the Red-footed Boobie from our list of favorite birds. 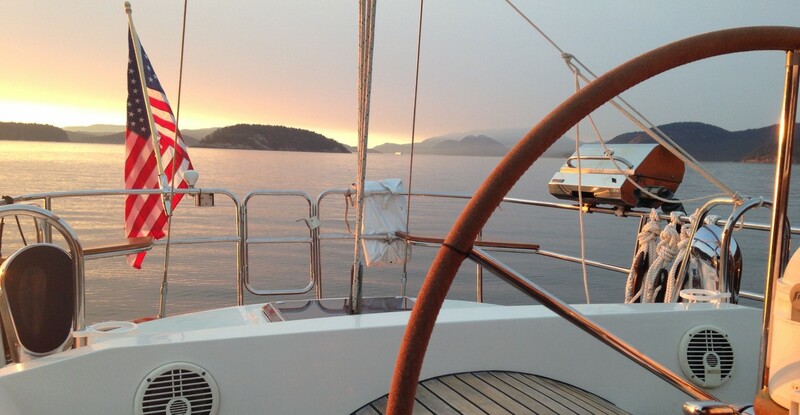 On the sailing front, we continue to take two steps forward and one step back. For the last two days we’ve had great wind propelling us west… unfortunately, we need to be going southwest. At night the wind lessens and we turn south and motor into it to get back on course. We anticipate at least another day or two of the same. Not the passage we would’ve picked had we had an option but we’ll get there sooner or later.